David Beckham launched his photography book 'David Beckham' today and, in fitting with his global brand, Beckham found an innovative way to release the book, allowing fans from London, Sao Paulo, Hyderabad and New York to participate in the launch. Beckham sat in a Facebook Digital Stadium in London, was interviewed by presenter Jake Humphrey and took questions that had previously been submitted by users on Facebook. 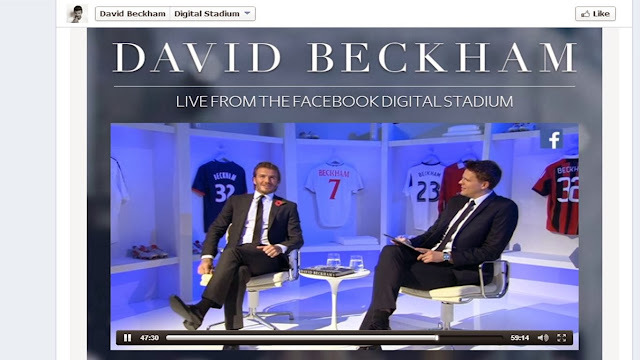 The whole David Beckham book launch session was streamed live on the David Beckham Facebook page and Beckham offered personalised digital autographs to Facebook users who tuned in. The Beckham book launch Facebook experience attracted a massive response. The David Beckham Facebook Page PTAT (People Talking About number) is now above 1m and the main post around today's book launch has attracted almost 300,000 Likes. Great stuff - and once again David Beckham shows us how to really do social media!